When building with hempcrete, consistency is important. What’s the biggest environmental benefit of using hempcrete? It’s carbon-negative! June 26, 2014—–According to Wikipedia, Hempcrete or industrial hemp is, “A mixture of hemp and lime used as a material for construction. Hemp breaths in 4 times the amount of CO2 that trees do, while having only a 12-14 week growth cycle. PBS.Org says,” Hempcrete is non toxic, efficient and mold free, and also insect and fire resistant.” It is for industrial purposes only, having very low levels of THC. 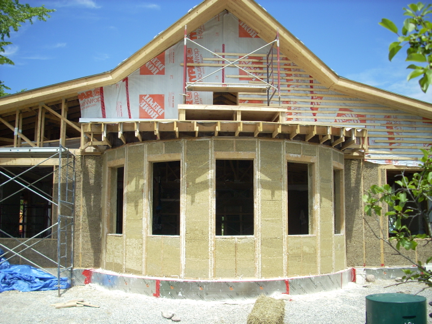 In construction, hempcrete uses include installation, flooring and walls. A company called HempTraders.com also sells hempboard for construction of furniture, counter tops, walls and shelving. .
American production of hemp was encouraged by the government in the 17th century for the production of rope, sails, and clothing, but there has been a ban on growth of industrial hemp since the 1970’s, preventing the production of hemp within the U.S. In June 2014, the Senate’s Appropriations committee voted to support industrial hemp research by Universities and the state’s Agricultural Departments, for research purposes, in states that permit it. This means that farmers can take part in the research, growing industrial hemp legally for the first time since the 70’s. Thirteen states—California, Colorado, Hawaii, Indiana, Kentucky, Maine, Montana, Nebraska, North Dakota, Oregon, Utah, Vermont and West Virginia—now allow industrial hemp farming for research and/or commercial purposes. On June 2, 2014, South Carolina Gov. Nikki Haley signed a bill to authorize growing of industrial hemp within the state, nullifying the unconstitutional federal ban. It states, “It is lawful for an individual to cultivate, produce or otherwise grow industrial hemp for lawful purposes….for hemp products. Hempcrete is a sustainable, low cost alternative to other building materials. A company called Hemp Technologies, founded by David Madera and based out of North Carolina, received the first permit to build a Hemp house in 2009, and has since built hemp homes in Hawaii, Texas, Idaho and North Carolina. This company is also consulting others who want to learn the technology of working with hempcrete. Mr. Madera first toured Europe, where building with hemp has been used for many years in the U.K., France, Belgium and Switzerland. Returning to the U.S., he held seminars to promote hempcrete homes, educating the public on the positive environmental impacts of material. In a short video on Hemp Technologies website, Madera shows how to use hemp in constructing a home. Hemp is mixed with lime and water, appearing very much like a cement mixture. He states that getting each batch of the mixture consistent is important because the walls are done in sections, starting from the bottom and working up. To build the walls of a home, hempcrete is poured into recycled plastic forms which are locked together and screwed into the wooden frames. This holds the hempcrete in place until it drys, in a 24 hour period. According to Madera, hempcrete is easier to work with than concrete and has a much lower carbon footprint, as concrete needs to be heated at high temperatures. Also, it has many benefits over strawbale homes because it breaths, doesn’t have mold, and has a lime based binder which pulls CO2 out of the atmosphere. The house will stay cool in the summer and warm in the winter, reducing heating costs. At a cost of approximately $12 per cubic foot, the walls can last up to 1,000 yrs! As we look to the future of using and producing sustainable products that don’t deplete our natural resources and are not harmful to the environment, hempcrete is likely to be a material that grows in popularity, creating a cleaner environment and providing a less expensive choice in home building, especially when grown locally. Categories: Building Green, Renewable Resources | Tags: hempboard, hempcrete, Renewable Resources, sustainable homes | Permalink.